Batter Up For A Cause: Autism Speaks! Batter Up: Autism Speaks is one week from tonight! Thanks to the incredible folks over at Metropolitan Hospitality and the New York Mets, an additional benefit will be added to the ticket! 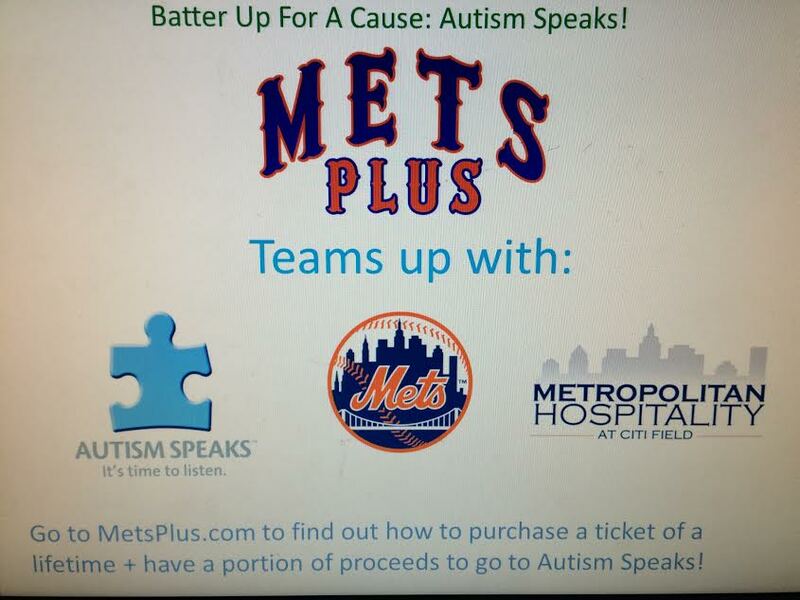 If we can get 5 tickets purchased through this MetsPlus exclusive offer, then a “bonus” ticket (to a 2015 New York Mets game) will be handed over to an autistic child. ( No Promotional code necessary, just use the provided link) This is a pure feel good offer, and a chance to make a kids day. I’ve worked with fellow kids that are battling with Autism, and it’s these small things that can put a smile on a kids day, especially a kid that has enough worries in front of him already. It’s a win win for you the fan, as you can help a child, and have fun yourself! Each ticket includes a once-in-a lifetime experience: Taking batting practice in the Citi Field batting cages! Meanwhile, light refreshments will be served and the best mascot in baseball, Mr.Met, will be there! Step up to the plate for a cause, and a good time, two ways in one!